I'm a huge fan of quilts too - more making than using, but all the quilts I've made have been for a big change - baby, wedding, big move. 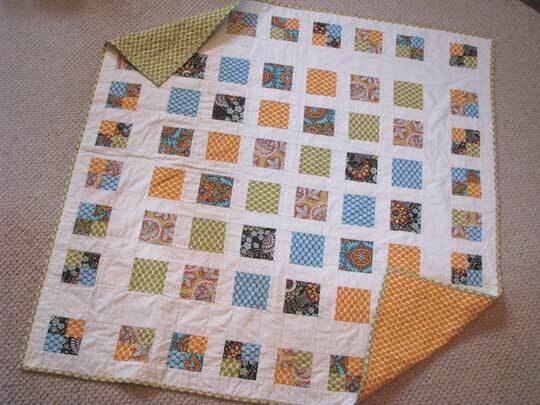 I like to use inspiration from: (tons of free block patterns)http://www.quilterscache.com/QuiltBlocksGalore.html. Its a little overwhelming, but it helps me, since there are lots of visuals - what it might look like in a finished quilt and samples of what other people have done. I used to make tiny quilts -- 4x6 or so. Are there pictures anywhere of your quilt? Did you set any other parameters -- color, size, etc? Love the quilt idea. My great-grandma goes to quilting every Wednesday and used to take my cousin and I with...I've always loved quilts and I think the idea of a wedding quilt is beautiful! Adore the quilt idea, such a homey touch!! Your wedding quilt inspired me to make a quilt for my wedding too. I'm half way done with the quilt. I can't wait to show it off at the wedding. Each picture and piece of fabric in the quilt symbolizes my fiance and I. I know for years to come we will have everlasting memories. Thank you for inspring me to make my own wedding quilt.